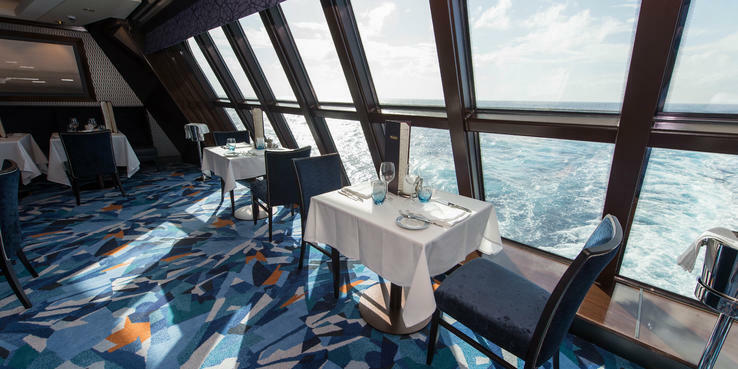 Norwegian Escape offers a wide variety of restaurants; passengers who don't want to spend extra on meals onboard have plenty of choices. On the flip side, it can be hard to resist the temptation of so many eclectic for-fee options onboard (such as a hibachi restaurant, a Brazilian churrascaria and a French bistro). The ship doesn't have a main dining room in the traditional sense, where everyone eats at set times in a large venue. Instead, it has a larger restaurant, called the Manhattan Room, and two smaller venues, Taste and Savor, which offer the same menus. Meals are "freestyle," meaning passengers can show up any time the venues are open when it's convenient for them, rather than at set times. These two restaurants, both of which are included in the basic cruise fare, sit across from one another, midship, with Mixx Bar in between. Menus are the same for both, and each layout offers a mix of seating arrangements, with tables for two to six and beyond. Breakfast fare is simple and continental-style, while the three-course lunch menu includes a mix of eclectic options, such as Vietnamese pho soup and hummus. For dinner, options range from a rotating selection of international dishes, along with some standards that are available every night. Just remember to save room for dessert, as the spread is extensive. For an extra fee, designated Chef's Signature Dishes can be paired with selected wine recommendations at lunch and dinner. For large families and groups, the Private Room at Taste offers a more secluded space and can be requested when making dinner reservations. Norwegian Escape's Manhattan Room is the largest complimentary dining venue onboard. It's a two-level restaurant with a spacious dance floor taking up a large swath of space near floor-to-ceiling windows at the back of the room. The dinner menu in the Manhattan Room is the same as in Taste and Savor. O'Sheehan's is Norwegian's Irish-inspired pub. The space, which overlooks the atrium, is divided into two areas (a larger bar section and a smaller dining section), but the food and drink menus are the same. In the dining section, tables and booths are available, and it's significantly quieter than the bar area. The comfort food-style fare is pretty average when it comes to quality; the plus is the venue is open 24 hours a day. The Garden Cafe is Escape's massive buffet complex. It's designed with stations, which repeat throughout so passengers don't have to do endless laps to make sure they didn't miss anything. This also effectively manages passenger flow, as lines are seldom long. In the morning, a wide range of breakfast options is available, though they don't vary much from day to day. Lunch options, on the other hand, change each day, though the most popular (the salad and pasta bar, for example) are available every day. Dinner includes carving stations, salad bars and a variety of hot mains and sides. Dessert options abound as well. The dedicated restaurant for The Haven's suite passengers is spacious, yet exclusive. Meals are similar to what you'll find on the rest of the ship but are a step up in terms of quality. A sizable seating area is just outside the entrance to the restaurant and makes for a great place to relax with a pre-dinner drink from the bar just steps away. This at-sea version of Jimmy Buffet's popular land-based eatery boasts a relaxing yet social atmosphere outdoors, only a few steps away from the water park. Menu items, for the most part, have either some type of island flair (Key West omelet with shrimp for breakfast) or Jimmy Buffet theme (Who's to Blame margarita or Cheeseburger in Paradise). The restaurant closes in poor weather. You'll want to book Teppanyaki early, as it's sold out most nights. The hibachi-style restaurant is more like a show, with the chef as the entertainment, and you -- the diners -- as the willing participants. Everyone sits at a square cooking station, which houses two chefs, a large grill/hot plate and 12 people on each side. The chef chops onions, throws eggs into his hat -- and occasionally "at" you -- and prepares the meal in front of your eyes. Theatrics notwithstanding, the food and quality of cooking are outstanding. On a casual and laid-back ship like Escape, Le Bistro is the spot to go for slightly upscale dining (the dress code requests no shorts). The venue is French through and through. Dine on the terrace and people-watch from a patio-style area outside the restaurant, or settle into one of the mood-lit tables inside. You can also choose from a selection of wine, or one of Le Bistro's featured cocktails, to pair with your dinner, which includes French classics such as escargot, coq au vin and bouillabaisse. The Supper Club embodies the slick ambiance of dinner theater with velvety blacks and reds and intimate seating. Here, passengers indulge in a three-course dinner with a show. Shows vary by cruise, with rotating guest performers. One show that's consistent is "Wine Lovers the Musical," a comedic afternoon lunch theater and wine-tasting experience, held on select afternoons. The cafe serves a variety of specialty coffees, teas and pastries. Norwegian's signature steakhouse, Cagney's offers indoor and outdoor seating in a traditionally designed setting with dark tones and booth seating. The menu, likewise, offers classic steakhouse dishes spread out among starters, main courses, sides and desserts. Couples looking for a more intimate dining experience should snag a seat outside, at sunset. Moderno Churrascaria, the ship's Brazilian steakhouse, gives diners a great bang for the buck -- with a massive hot and cold salad bar, myriad sides and the popular pao de queijo (cheese bread), all in addition to roving meats dished out by passadors. You'll be lucky if you can save room for dessert. While there is plenty of seating spread out inside, those looking for a more intimate setting can enjoy the outdoor seating. This elegant yet relaxed eatery offers a variety of Spanish delicacies -- and views of either all the action from inside, or the ocean outside along The Waterfront. Traditional Spanish tapas are available at Pincho Tapas Bar, a casual spot, adjacent to Bayamo. Dishes like calamari and imported ham are prepared on an authentic la plancha grill, tableside, as diners watch. Norwegian Escape's Italian restaurant, La Cucina, is the place to go for a long, relaxing meal. Savor traditional Italian by choosing from several starters, main courses -- including a whole menu section dedicated to pasta and risotto – and, of course, dessert. Food Republic offers cruisers the chance to splurge on international gourmet dishes. The emphasis is clearly on Asian cuisine, and portions are tapas-size, making the plates great for sharing. Diners order and pay via iPads, and the food comes out quickly; you can even belly up to the food bar to watch the chefs prepare your order. Light gastropub-style snacks are available at this brew pub venue during lunch and dinner hours. Get your sweet fix at The Bake Shop, where you can find cupcakes, pastries, pralines and macarons. Prices start at $1.50 per item. Grab a scoop or two of gelato at Dolce Gelato, located on The Waterfront. You can order cups or cones starting at $2.50.